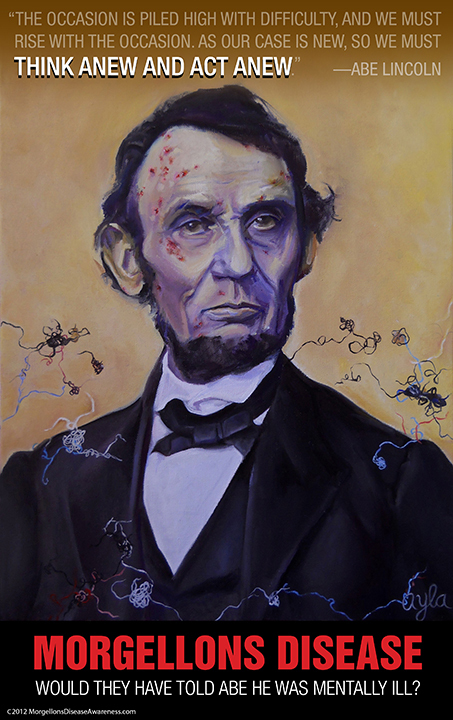 Below are the series of oil paintings I created for Morgellons awareness. Previous to working on these images I had not painted in more than 25 years. My background is a graphic designer for more than 30 years. ﻿Feel free to print it out, and include it with any correspondence to the media, or to elected officials. Click on the image to download the pdf to your computer. Please let me know if there are problems downloading the images. Note: You must select 'vertical' orientation in 'Page Setup' on your computer for the poster to print correctly. 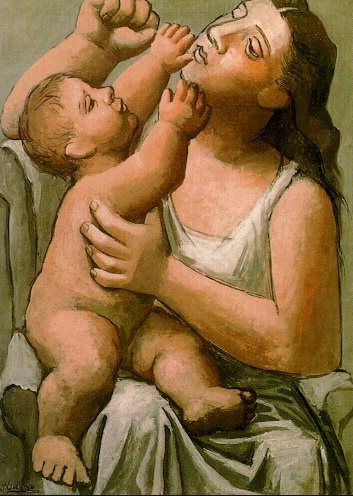 Image below based on Picasso's "Mother and Child." Picasso had many artistic periods. The "Blue Period," depicts his subjects painted mainly in hues of blue and green. The images were somber, depicting prostitutes, beggars and drunks and were supposedly a product of Picasso's depression because a friend had taken his own life. Picasso painted a portrait, Mother and Child in his 'Rose Period.' It's tone is peaceful and the painting is suffused with pinks and warm feelie colors. 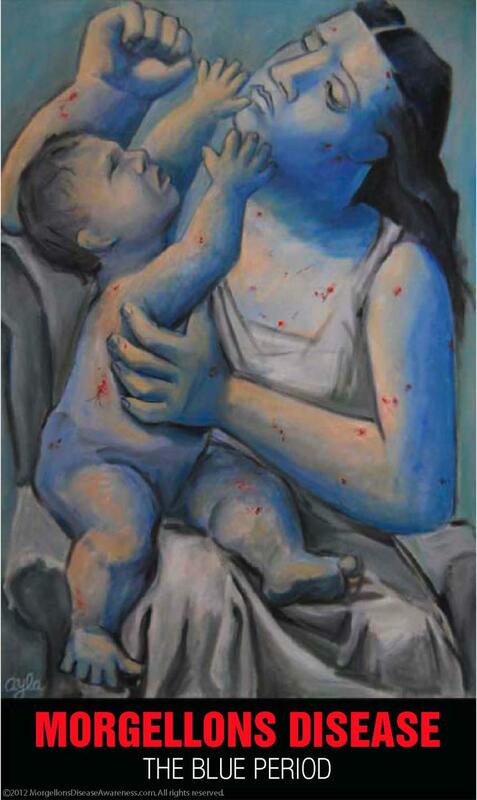 Below is my version of Picasso's Mother and Child as if it were painted in the blue period. There is a knock at the door. I open it to a tall thin Caucasian male. The mantle of the door casts a shadow over his eyes so I cannot immediately see him. As he steps forward and into the light, I see his eyes are agitated, his static electric hair, stands straight out in a circular half crown around his head. His face is dark, serious, senuous, pained and possibly You dirty. My first impulse is fear—and hatred—the hatred arising from the fear. I harden myself and shut him out, like a comma in my consciousness, keeping some part sectioned off from absorbing a sense of him. As we stand there sizing each other up, I begin to see the quiet way his breath moves through him and a resonating aura of compassion emanating. Instead of a derelict wanderer, I now see an embodiment of Christ. His coat is wrinkled, the sleeves slightly frayed white and stopping short an inch above his wrist, but it is made of quite fine woolen threads. He extends his hand towards me and is holding a tube of cerulean blue paint. I reach back to receive the gift. "I believe this is yours," he quietly murmurs. I nod carefully. He slowly turns and haltingly walks back out into the night. Gently I close the door and wait till I hear that final click. 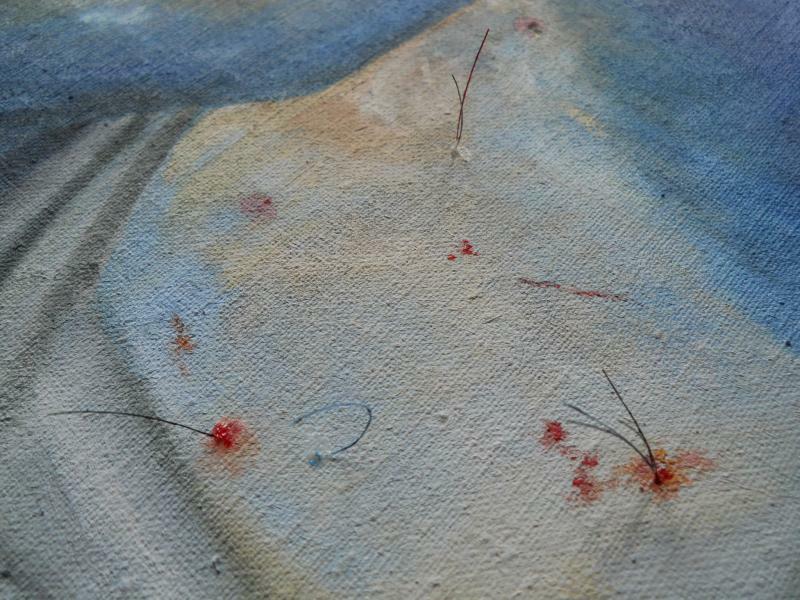 This painting has 3-dimensional fibers protruding from the canvas (see closeup). 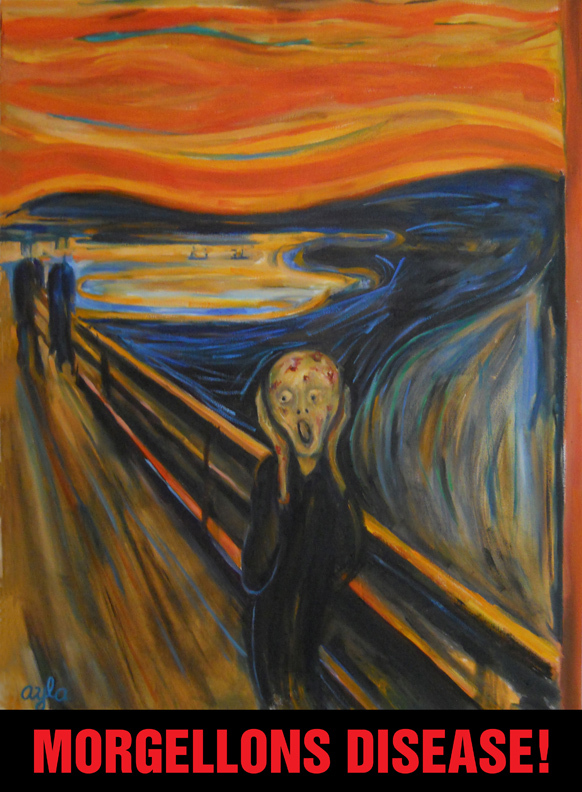 Below: Edvard Munch's painting "The Scream" Painted: March, 2012. Seems fairly self-evident. 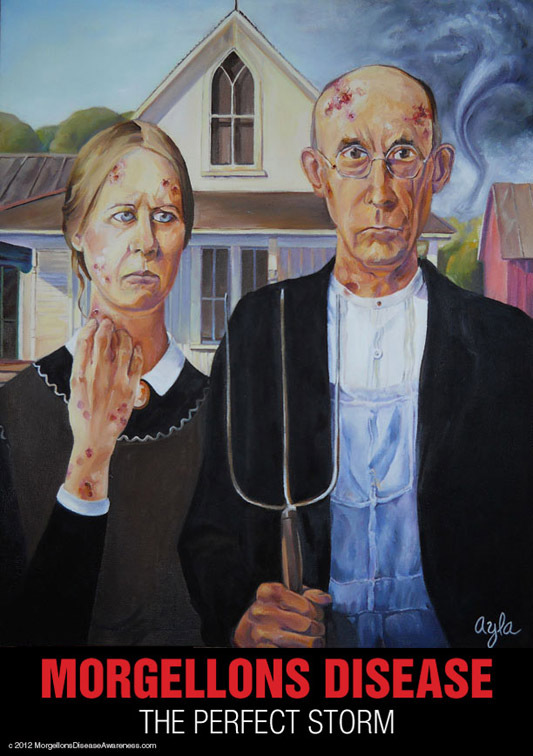 Below: Grant Wood's "American Gothic" meets Morgellons. The perfect storm. 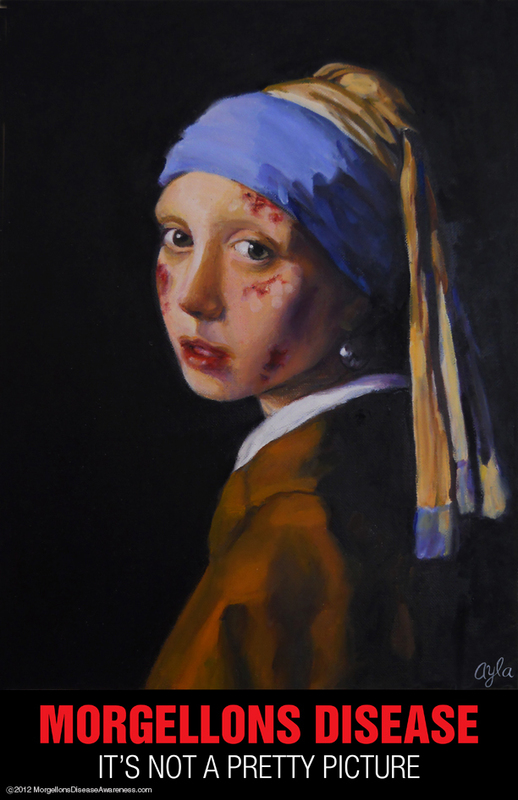 ﻿Painted: February, 2012. The figures are aware of their illness but have no answers. The tornado painted behind them is an unseen threat. They unknowingly stand in it's path. The sun still shines off to the left as the storm gathers momentum. This 8.5"x11" poster below can be downloaded and printed out on your home printer. 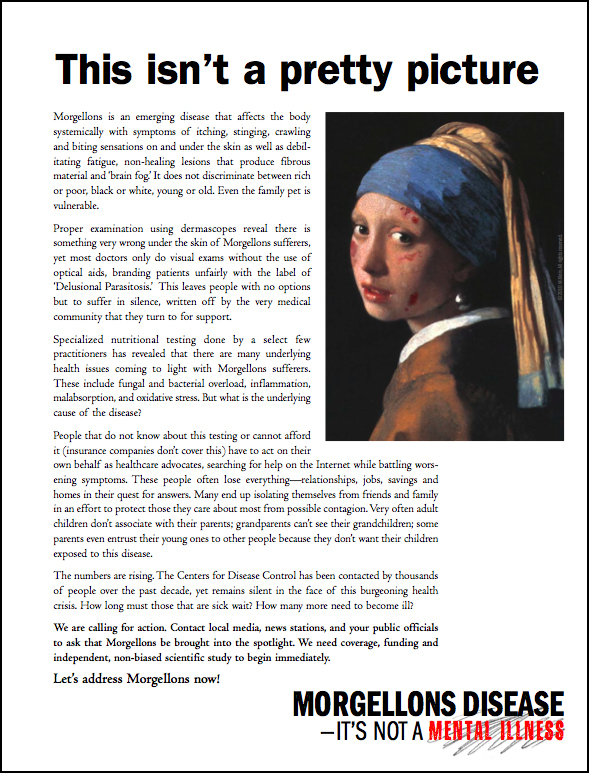 You can post it, mail to your doctor, send it to public officials and the media. Anything that suits your fancy. for the poster to print correctly.